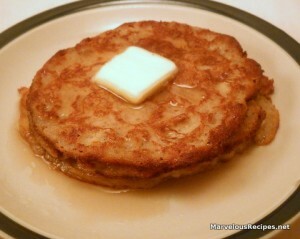 I have been experimenting for the past few weeks trying to come up with a “good tasting” low-carb pancake recipe. This is the best one I have come up with so far. They are not the same as the original high-carb pancakes but I think they taste really good and they are incredibly easy-to-make. I serve them hot off the griddle topped with butter and sugar-free maple syrup with a couple of slices of crisp cooked bacon on the side. 1. Preheat a greased griddle or skillet over medium heat. 2. Put all the ingredients in a blender or food processor. Pulse for 15 seconds; stop and scrape sides with a rubber spatula. Pulse for an additional 15 seconds or until well blended. 3. Spoon 2-3 tablespoons pancake mixture onto a greased hot griddle or skillet; cook 1 to 2 minutes on each side.This recipe makes about 12 pancakes each containing about 1 carb. *Watch them carefully since soy flour tends to burn quicker than regular flour. Making the pancakes small enables you to turn them easier. **If you do not have oat bran on hand simply put some dry oatmeal in your blender or food processor and process a few seconds on pulse setting. I love the recipe. It is simple, delicious, nutritious, and a healthy food. It can help through my diet for it’s low-carbo content. Great idea and it is really wonderful to follow these recipe at home. Thank you so much for this menu.. I am looking forward for more recipes from you. Great!